Electroluminescent painted guitars are THE hottest thing to hit music venues and backyard campfires! Think about it; a dark venue, a Lumilor lit guitar. What could be more awesome? Lumilor is an Electroluminescent Coating System that allows us to spray paint pretty much any surface into a light without changing the object at all. 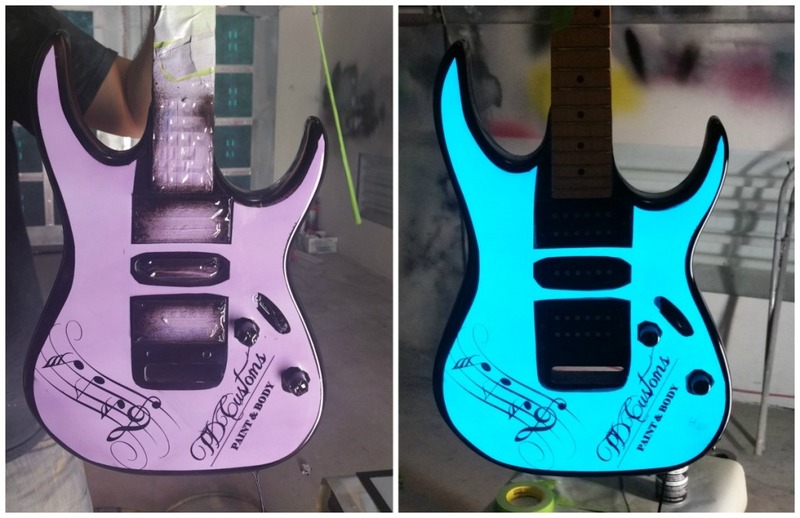 The electroluminescent paint will become a part of the guitar. The wiring and a simple on/off switch allow us to control when the guitar lights up and turns off. We wire the paint straight to an electric current, and all you can see is a clean, illumination. This guitar was painted to be fully lit. The light up paint is sprayed as the base, and then we add a top coat after. In this case, we painted the guitar purple with black music notes and a TD Customs logo. There are many possibilities for how to design the guitar with Lumilor and different top coat options. There are a couple options for wiring a Lumilor lit guitar. We can wire the paint job to a small, 9-volt battery pack, or connect it to a power cord, like a laptop would have. If your guitar has to plug in to an electrical outlet anyway, we suggest using a power cord that will run along with the other cord. If you plan to be on the go with your guitar and don’t want to use a cord, we can set up a simple battery pack. Ready for a lit up guitar of your own? Another design option would be to only light up certain areas. You could have a specific design, image, logo or other artwork light up, while keeping the remaining areas unlit. For example, with this guitar’s design you could choose to have only the music notes light up, while the background stays dark. As a specialized custom paint shop, we are happy to work with you to create the right design and look you are going for. For an electroluminescent painted guitar of your own or to discuss another Lumilor idea you have, contact us to discuss or fill out a Get Lit Request form. 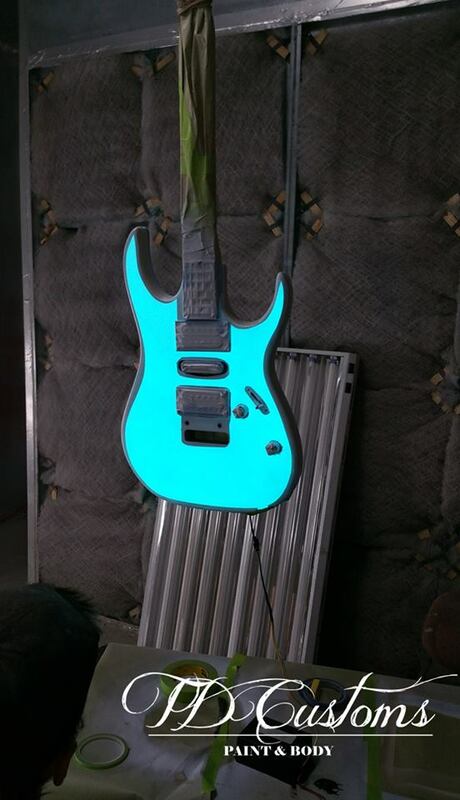 No Replies to "Electroluminescent Painted Guitar"